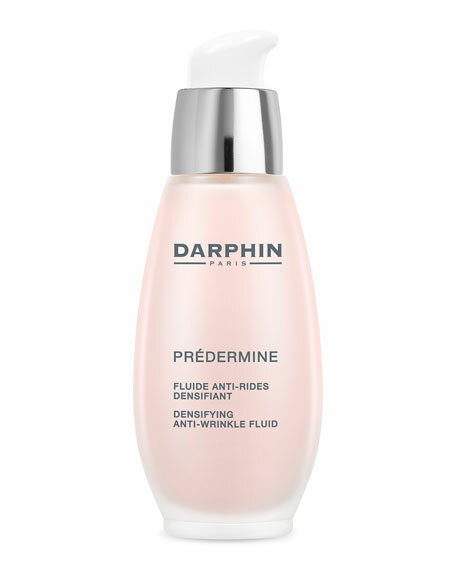 Darphin PREDERMINE Densifying Anti-Wrinkle Fluid, 1.7 oz. DarphinPREDERMINE Densifying Anti-Wrinkle Fluid, 1.7 oz. A delectable, whisper-light fluid improves skin's firmness and smoothes lines and deep wrinkles. Moisturizes skin leaving it plump with renewed elasticity and helps repair and strengthen skin's natural barrier. Prefer a light cream texture. Helps protect natural collagen and elastin fibers. Densifies and firms the skin. Skin appears smoother, plumper, softer. Lines and pronounced wrinkles are visibly reduced. Skin is firmer, regains elasticity and resilience. Skin's natural barrier is strengthened. Skin texture is improved and moisturized all day long. Renewed natural radiance with silky matte finish. How to use: AM/PM apply to perfectly clean skin over face and neck. Massage gently with fingertips in upward motions from the inner the outer part of the face. Use in the morning after the Serum to and in the evening after the Aromatic Care. For combination skin. Dermatologist tested. 1.7 ounces. For in-store inquiries, use sku #167784.